To most cycling fans the Tour of Poland will be the one they don’t know much about, if anything. 2005 was celebrated hughely when the Polish request was honoured by the UCI to promote this race to the ProTour. Up to that year no big team even bothered to come to Poland. Therefore you won’t find any really big names on the winners list. Laurent Brochard, Serguei Ivanov and Dariusz Baranowski are probably the best known by the general public. Baranowski won the Tour de Pologne three times in a row and three times for a different team. 2005 already brought a bigger name onto the leaderboard, Kim Kirchen. The first edition from Poland already dates from 1928. Eight stages and 1500 kilometres to the final finishline, Feliks Wiêcek the first one to cross it and went away with the overall win. After the following year no races are held until 1933. Again a difficult period for Poland, the next one is ridden in 1937. The 1939 edition was the last pre-War Tour of Poland. Anyone knows that Poland was hit very hard during the Second World War. Bad winters and famine struck the country during and directly after the War. The polish tried to get some sort of organisation going again, but the 1947 and ’49 editions were all they could manage at the time. In 1952 finally some light on the horizon; a steady organisation got things on the right track again. The race has been held every year since. At the moment the organisation is in the hands of the “Lang Team”. Lang, himself a former winner (1980) here, a proud cyclist with love for the sport, is just the right man for the job. He likes the media and they love him. But mostly, he is popular with the crowds as well because of his cycling history. So this now looks like a marriage made in heaven for the cycling crazy Polish fans, who come out in large numbers when the race is held. With such a positive and enthousiastic man at the helm and the backing by the UCI’s ProTour emblem on the race, we will probably see many well known cycling names on the Polish palmares soon. 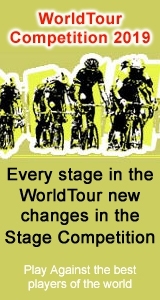 The only drawback this Poland Tour now has is the recent 2006 UCI calendar shuffle. Very unfortunatly this race is now sceduled at the same time the Vuelta a España is programmed. The organisers now have to hope that the ProTour teams will send good squads, so this locally very popular race gets some more international recognition.